For several years, I have firmly believed that there has always been one aspect that made Marvel and DC two very different companies. The stories. Marvel stories range from the super powered and non-super powered heroes, but they are always done in a way that you can connect with the characters on screen. They almost always feel as if they are in the same universe. From the beginning, I’ve never understood Thor as part of the Marvel universe. I had absolutely no idea how they could pull off a god and get away with it feeling like the same universe as Iron Man and the Hulk. To be honest, I still don’t really understand it, but I’m happy with how they decided to present it in the movie. Just before Thor was promoted as King of Asgard, a few Frost Giants break into the kingdom, and Thor decides it would be a good idea to retaliate and bring war to the Frost Giants. His father, Odin, banishes Thor for acting as a child, sending him to Earth to learn what it means to live. There he meets scientists Jane and Erik as they come face to face with S.H.I.E.L.D., who confiscate their research. S.H.I.E.L.D. is currently trying to lift Thor’s Hammer, which surfaced somewhere in New Mexico. No one, including Thor, can lift it until they are worthy. Meanwhile, Loki goes evil and begins his disastrous plot in Asgard. The main reason I’m not so fond of this film is – as I’ve mentioned above, it doesn’t feel like Marvel to me. It’s about a god and Norse mythology, and that all feels really…iffy to me in regards to everything I’ve ever come to know about Marvel thus far. On the other hand, the reason why I am happy with how it was presented, was because it primarily takes place on Earth in a fish-out-of-water type theme. So it’s actually pretty hilarious. That humor feels like Marvel, as they are pretty well known for their sense of humor. I am worried, however, about the sequel, as it looks like it will take place…not…on Earth. Also, I’m beginning to think people didn’t watch this for its connection to The Avengers. In fact, it screwed itself over by the end of this film as to how Thor can’t even come back to Earth for the events of The Avengers. A lot of it, I imagine, had to do with having Thor swooning the ladies. Also, even the connections to The Avengers were lacking in general. Yes, they had Agent Coulson, and they mentioned Tony Stark and even The Hulk, but only barely. Not enough or it to actually feel like it’s a part of the series. The only way I can actually enjoy this movie the most is if I don’t consider it a part of the same universe, and consider it a complete standalone film. 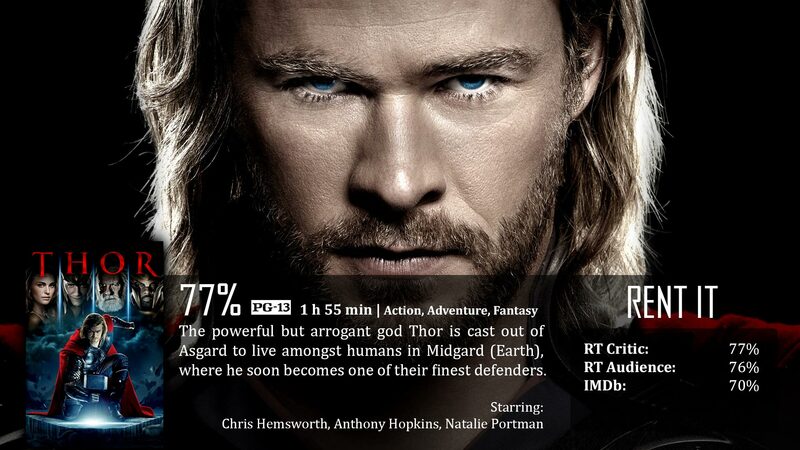 Now…then again I’m totally biased against Thor. The main connection to the eventual Avengers film, of course, was the special scene after the credits including the Erik character, Nick Fury, and Loki. It should be noted that if you are actually familiar with Norse mythology, you might actually understand and enjoy this film more so than if you didn’t. However, it’s not completely necessary that you have this knowledge. When it comes down to me, for example, it doesn’t matter. They did what they did well, but my main concern is simply the Marvel feel. Thor is great as another addition to the overall Avengers development, as well as a film that delivers fresh comedic material. Its Norse and alien background may feel foreign to Marvel fans used to stories that remain grounded right here in our own backyard. The main reason Thor was created in the comics is basically “what if Thor WASN’T a god”. What if he was just a super powerful alien, and because of how much more powerful he was, humans treated him like a god and based their religion around asgardians and beings from the other realms. If you look at it that way, it fits perfectly in the universe imo. Actually, Norse mythology has a “Helheim” which mimics our concept of hell. 2. Want to be worshiped. None of those apply. The Asgardians are nothing but powerful aliens. That’s it. They travel between worlds through wormholes, as explained in the movie. They have advanced strength and science, as explained in the movie. Thousands of years ago when Asgardians first set foot on earth, the humans saw this great strength and technology as magic, and treated them like gods. They weren’t gods, but humans thought they were, because at the time they had no other explanation. They created a whole religion around them, but none of that is the truth. This is Marvel’s way of explaining how Asgardians could exist in real life. Giving a scientific explanation for their existence by explaining that they’re not gods at all. It is extremely grounded in reality and it’s a believable explanation that makes sense in that universe imo. Very nice review. I really liked this movie. I get what you’re saying about how it fits in the Marvel universe. But being a long time comics guy, I love how Thor fits into the world. For me this movie ran the greatest risk of being the corniest and cheesiest of any of their projects. But I love how they embraced that to a degree and still managed to deliver a really fun movie that overall worked for me.